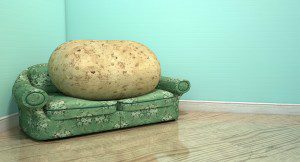 Do We have a Couch Potato Storytelling Culture? You are here: Home / Customer Experience, Success, Loyalty, Retention / Do We have a Couch Potato Storytelling Culture? Does our organization engage in a couch potato storytelling culture? We know the plot. A client has a problem. They are in crisis and call our company. Our company solves the client’s problem. And everyone lives happily ever-after. And returns to their couches. End of story. Yes, solving big hairy problems for clients certainly is both dramatic and impressive. However, consider that the majority of clients really do not want to wait until they have a big hairy problem for us to solve. In fact, current and potential clients do business with us in the first place, because we promise to have their backs. At all times. Or at least they hope so. A couch potato storytelling culture is self-focused. There are a number of new books out, currently, which discuss how our organization’s stories make our products and services (not even our people) the heroines of the day. Thus, customers do business with us because it is “all about us.” Not them. In addition, we always are on the lookout for the most dramatic, sensational stories which feature how “we” solved a problem. And “we” are hoping that anyone who hears about our solution, will hope that their company also has that exact problem. So we can, once again, become the star of their crisis. A couch potato storytelling culture emphasizes drama over minor skirmishes. If any. What if current and potential customers run their businesses well-enough, so that big, hairy problems never, or rarely, occur? Our drama, and self-focus, actually backfire. We turn them off. We will not have their backs unless something big enough happens for us to “star” in. While we are ensconced on our couches, waiting for the next “something big” to happen, some of our best customers are staying their own courses. Creating their own stories without us. Or maybe even because of us. But we will never know, will we? Since there is no drama involved, and we are comfortably on that organizational couch, we do not pay attention to them. Until it is time to renew their contract. Sometimes the best customer-focused stories are the ones our organization never pays attention to. These stories may come from the middle of the customer experience scorecard pack. However, our organization ignores these compelling tales because the customers perceive our products, services and people to be “enough” to meet their ongoing needs. Realistically, their customer experience of “us” is not stellar. Just adequate. Adequate enough for them to continue to do business with us. And they remain successful. However, because there is no red flag for us to react to, or crisis to fix and dramatize in our stories, we stay on the couch. Also, we stay out of these customers’ way. And that strategy reinforces the flaws in our coach potato storytelling culture. Tragically, the majority of clients never become the subjects of a couch potato storytelling culture. When our organization’s storytelling culture (if indeed we have one) is the responsibility of, say, the marketing or public relations department, we can miss the best stories of all. Where, in fact, the client is thriving, happily ever after. Due to a solid mix of our products and services. Along with the client’s exceptional decision-making. Thus creating a portfolio of complementary products and services to fit their company’s growth strategy. These clients, and these successes, are waiting for our organizations to discover them. However, these types of stories involve our getting of our cultural couches. And a different – and collaborative – course of storytelling action than we complacently are used to. Often, the best sources of these stories involve our clients’ own people, not our products and services. As a result, everyone in our organization becomes a critical factor in discovering just who these clients, and employees, are. Workforce engagement uncovers the best customer stories. Because when we explore to discover stories that begin with “and these clients currently are living happily ever after,” we move one millimeter beyond a couch potato storytelling culture. Into a more customer success-focused strategy. How about getting off the couch? Learn how to discover the most compelling – and relevant – client stories! Move one millimeter beyond what is comfortable, towards what is Possible. Today. How? Babette Ten Haken’s One Millimeter Mindset™ speaking programs showcase how profitable collaboration catalyzes purposeful, innovative personal development, leadership communication and business growth. Her professional speaker profile appears on the espeakers platform. She is a member of SME, ASQ, SHRM and the National Speakers Association. Babette’s Playbook of collaboration hacks, Do YOU Mean Business? is available on Amazon.com.